The groove-type found on a Blue Note record offers a useful indication of the probable date of manufacture, and can help confirm or discount the status of a particular copy being an “original pressing”. 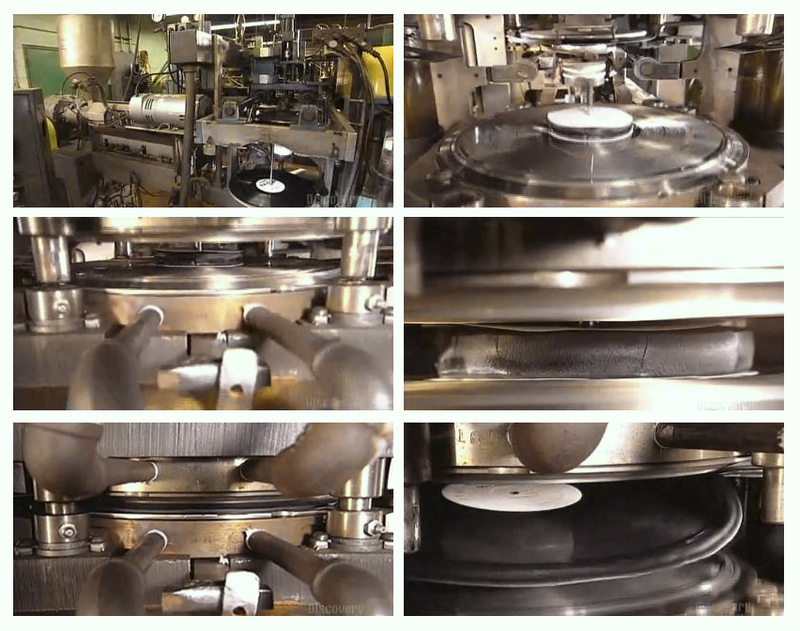 In the latter part of 1960, new dies were introduced at the Plastylite pressing plant which behind left merely a single “step” – not a deep groove. The old DG and new non-DG dies were functionally interchangeable and coexisted for some four years, until the last of the old deep groove dies finally became worn out and discarded. All pressings thereafter were “no deep groove”. 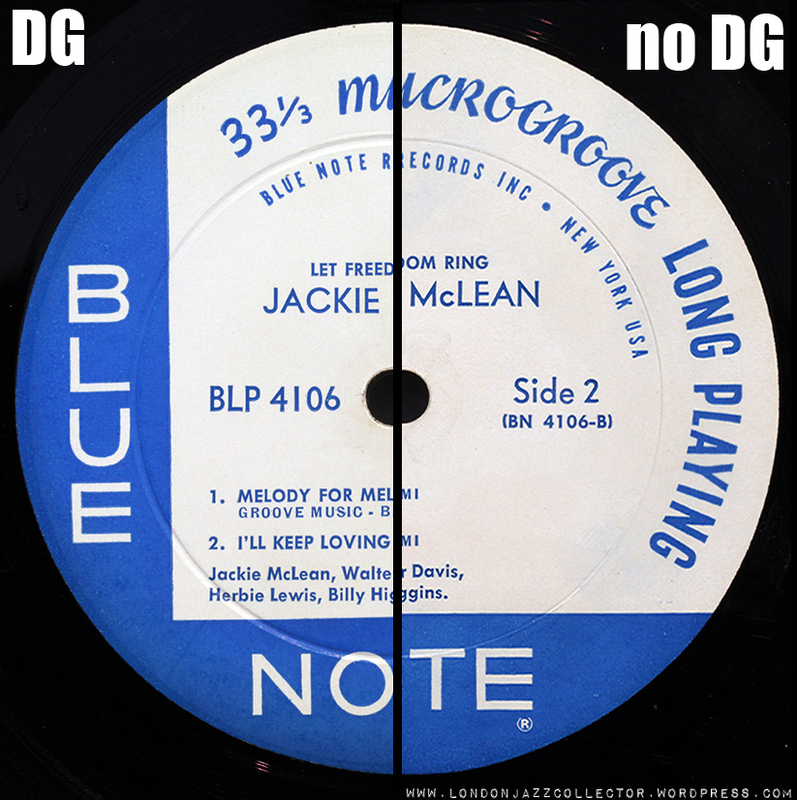 During the transitional four years, original pressings appeared with every combination of die types: both DG, both non-DG, and DG only one side or the other. Various collector theories have been offered, about the use of old dies for re-pressings, new dies for new original pressings, but more likely it was simply arbitrary and random choice by the press operator. Nevertheless many original pressing have an historical established pattern. Deep Groove (DG) on Side One and no Deep Groove on Side Two. Many original pressings are undisputably associated with specific die pattern , until the arrival of new dies. When a record differs from the expected die type – no deep groove on a Fifties release, it is indicative of a later pressing. Only a handful of titles during the changeover late 1960 early 1961 (mostly between BN 4059-68) are known exceptions, with deep groove on one side and no deep groove on the other. In the years that followed, coinciding more or less with the introduction of the New York USA label, the first pressing of around 180 new titles by Blue Note all are no deep groove. The definition of a “first pressing” is not as clear as some would like. Each time a batch of a particular record was pressed, or repressed, it was possible that a different combination of die types could occur when mounting the stampers. The recollection of a Plastylite press operator at that time was that records were pressed in small batches, with a half dozen presses in operation at the New Jersey plant, and that die selection was merely whatever came to hand when mounting stampers on the press. Some records may indeed had just one single pressing in a continuous run, which for small-selling titles and early 1500 series that was probably the case – and must be DG both sides. However there were re-pressings within the exclusively deep groove period, and as Blue Note sales volume increased, more copies pressed, the groove type and pressing status becomes less certain. The presence or absence of deep groove is not a guarantee of superior audiophile performance, which is impacted by many other factors. Early pressings suffered more wear and tear over the years. 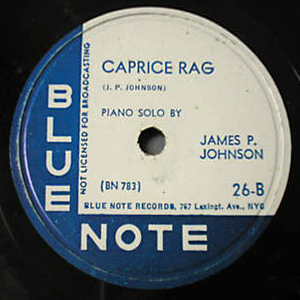 Second and subsequent pressings by Plastylite still employed stampers derived from the same intermediate Van Gelder metalwork, and still sound distinctively “Blue Note”, and are often in better condition. However, sentiment still holds sway over many collectors: they want a piece of history, they want the original. 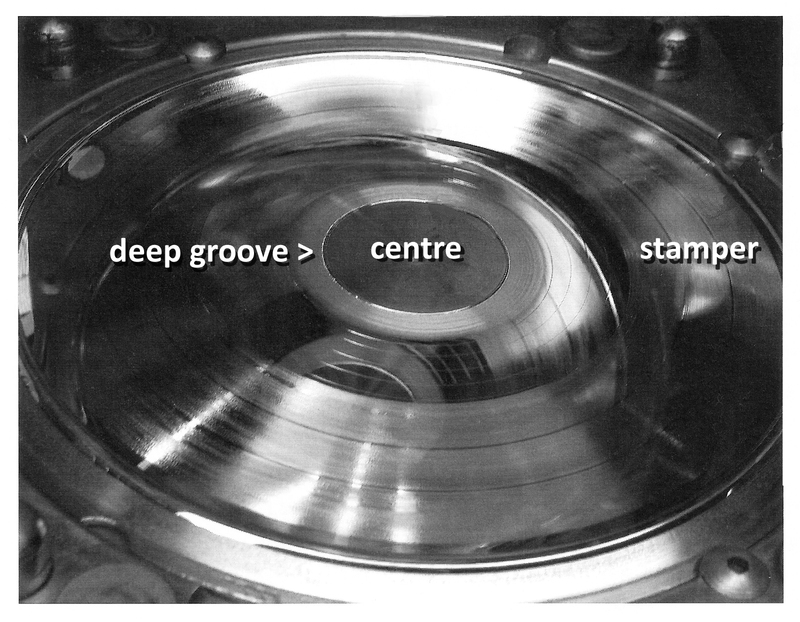 To better understand the phenomenon of deep groove, see the LJC Slackers Guide to making records below and gain “Instant Expert” Status. Music is cut onto a master laquer by lathe. All that important information (catalogue number, master engineer signature) stamped or written is here on the runout area of the soft laquer. Mother/stamper positive/negative metal parts are created. The stamper central area is punched out. Printed paper labels are trimmed and center-punched ready for use. Hot vinyl biscuit is sandwiched by labels, and mounted between a side A and side B stamper. Ensuring the labels were bone dry was critical at this point, as any moisture converts to steam during pressing. The press applies 100 tons pressure to the biscuit at a temperature near 200 C for 30 seconds, pressing the grooves from the stamper image into the vinyl. As the press lifts away from the newly pressed record (bottom right) you see the indentation left behind in the central label area by the metal dies holding the stampers in the press. Deep Groove, or not Deep Groove, this is where it all happened. Congratulations.You are now a fully certified 30-second Vinyl Expert, saving nearly four minutes on watching the whole Discovery Channel You Tube. The deep groove has its origins in the pressing 78 r.p.m. records. The deep groove circle is just slightly smaller than the label of a 78, located within the label edge. As the recording and distribution medium switched from the breakable shellac 78 first to the 10″” and then 12″ unbreakable microgroove 33/1/3 LP, with its larger label, the deep groove was incorporated into the design of the new labels. Deep groove remained a feature during this period until pressing plants commissioning new presses to keep up with the expanding demand for vinyl records, phasing out the old presses, and with them, the older deep groove dies. An example of more PPM – pressing plant mayhem – is this interesting “anomaly” on the Prestige label (photo courtesy of Albert of Ohio) of Coltrane’s 1958 recording Black Pearls, first released by Prestige in August 1964. Stereo copies of the original pressing exist with different label designs, one with deep groove, another with no deep groove. These differences are almost certainly attributed to the spread of manufacture to different plants, who may also have been tasked to print labels locally, hence variations in typesetting, pressing dies, even the use of “out of date” designs. Whilst Blue Note used just one plant, Plastylite (plus one known exception), it became common for some labels to press at two or three plant location, some times contracting pressing to independents for cost advantage. Anyone with a more serious interest in the subject of pressing die indentations on record labels, I recommend to seek professional help. Or indeed amateur help, such as myself. groove known originals. Is it a try original press or just a 2nd press that seems very rare? I was wondering if you can answer a deep groove question for me: If Plastylite was doing original pressings without deep groove after 1961, why are there various original versions of Lee Morgan’s The Sidewinder (which was released on the cusp of 63/64) floating around with both deep and shallow grooves? Mine does not have the deep groove but it has the P, Rudy stamp, NY/USA labels and is very heavy. I’ve seen others with the deep groove and Fred Cohen’s book lists the original as DG. I know it was an extremely popular title upon its release so it may have been pressed on different machines – what is your take on this? Sidewinder was a huge hit for Blue Note and if any title was a candidate for “exceptional measures” this was it. I have never seen anything documented but It is quite likely Plastylite had a number of pressing machines and supposedly newer and older machines, which were tasked for different purposes, though I don’t think anyone really knows what went on inside the Plastylite plant day to day. Most all of the titles in the catalogue around 4157 are not deep groove, stretching back two or three years at least. If the plant had all or much of its capacity churning out copies of Sidewinder to keep up with the demand, then it is quite plausible that a box of old DG pressing dies could exceptionally have been brought into service along with mothballed presses. Manufacturing practice is messy, the focus is on getting the job done. What constitutes a “First Pressing” with high volume production run or runs like Sidewinder seems academic, less so on rare titles. My copy is DG on side 1, plain on the other and has a 1964 “25 years of” inner sleeve, weight 148gm, but its stereo. Perhaps Cohen has his reasons but Sidewinder just might break some of the normal rules. Oh the joys of Blue Note. Thanks so much for your reply! I weighed my copy and it is a solid 185gram. (It’s stereo as well.) Unfortunately, it didn’t have the original inner sleeve but I know it should be the “25 years.” Yes, it is indeed a mystery. RE 23,946, incidentally, was a reissue of an earlier patent, 2,631,859 which was within the rim print of many a Capitol LP (and some 45’s) from the late 1950’s well into the early-to-mid-’70’s. As well, by the early ’60’s, Research Craft replaced their deep groove (same as what Columbia had) with a non-deep groove of 2.875″ diameter which was also on pressings of many West Coast plants including Monarch Record Mfg. and Custom Record Mfg. This was the Research Craft plant that in 1965 was acquired by Liberty – and pressed many Blue Notes after the late ’60’s. W.B. – your depth of knowledge is always appreciated. Thanks. Do you know which pressing plant produced records with a serrated edge found on some Riverside & Liberty issue Blue Notes in the latter half of the 60’s? I don’t know but if anyone does, its W.B. Honoured. If its any help I have a picture of said serrated edge here. It was found on a Liberty re-issue of BNST 4079 Lou Donaldson’s Gravy Train, Division of Liberty label, RVG STEREO in runout, It’s one of only two serated edge pressings I have. The Other is Hank Mobley’s High Voltage, another Liberty years pressing. It has to be said neither is a particularly good pressing. It’s possible (though not a guarantee) that the serrated outside edge would’ve been attributable to the All Disc Records plant of Roselle, NJ, which Liberty acquired in 1966. 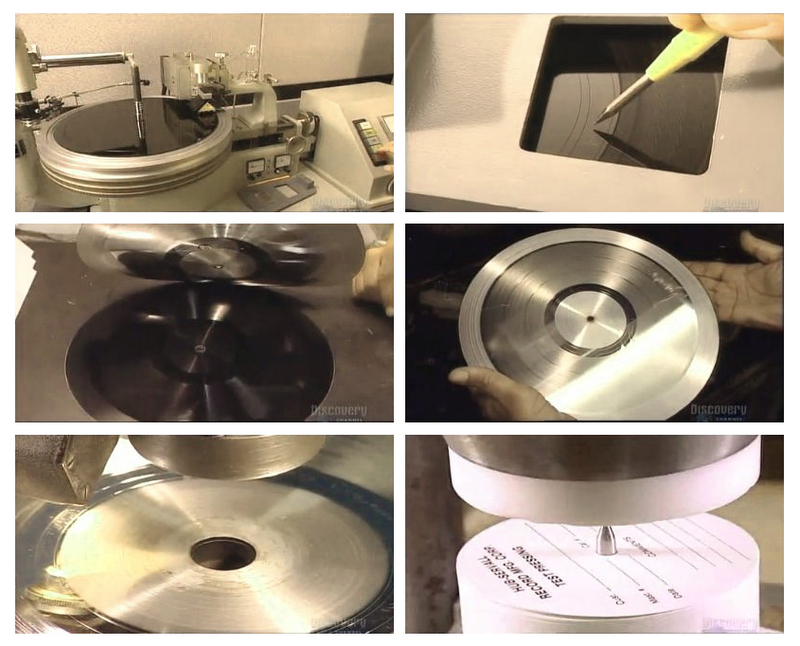 By then they had a 2.75″ circular indent which was also used by some other pressing plants (i.e. Sonic Recording Products of Hicksville and later Holbrook, NY; Dynamic LP Stereo of East Newark, NJ; Allentown Record Co. of Allentown, PA; Keel Mfg. [later Hauppauge Record Mfg.] of Hauppauge, NY; and many others I can’t gauge at this time). Unless Liberty used Abbey Record Mfg. for this Blue Note pressing. Any other markings in the deadwax besides what you’d noted? My vinyl and I are separated at this moment, so I am not in a position to check. 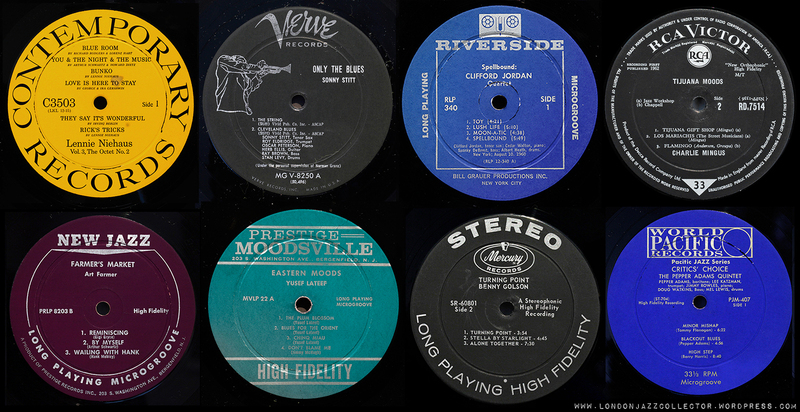 All Disc is credited with the bulk of Blue Note pressing for Liberty at least in the early years post acquisition. If it was the handiwork of All Disc so I would have expected serated edge to be very common, but in seventy-odd Division of Liberty pressings I have only two with serated edge. I’ll have to check but I am pretty sure there is no AB engraving, so it sure is a puzzle. I wonder if a serated edge appears on any other labels than Liberty/Blue Note? I have a black label DG twin reel stereo copy of Bill Evans – How My Heart Sings on Riverside which has edges like a buzzsaw. I have a budget copy of a Charlie Parker / Miles Davis LP that I think is on the Baronet label. It isn’t particular good sounding but it also has a serrated edge and was the first time I’d ever seen a record like that. Makes listening to records surely feel like ‘living on the edge’ haha with that look. Seems more fitting maybe for a Black Sabbath or an Alice Cooper album maybe than a jazz record…. Just checked my Liberty mono copy of The Stylings Of Silver that has the serrated edge and there are no other marks in the deadwax besides the catalog number, RVG and the mysterious 9M, just like the original pressing minus the Plastylite “ear”. My Riverside stereo copy of Bill Evans How My Heart sings with the serrated edge has a small ring, slightly larger than 3/4″, around the spindle hole on the B side. My stereo copy of How My Heart Sings with serrated edge has puzzling marks. It has a pseudo-deep grooves, meaning it looks like a DG on both sides, but they are not actually grooves, but rather two-step-down rings. Until you actually felt it, you would swear it was a DG. In the matrix is a handwritten catalog number – RS 9743 – but then a difficult to read crossed-out mark that is DK 151 or DK 757 or DK 157. No other pressing plant marks I can see. I’ve a question. If a deep groove is a deep groove, how do you call the other one? “Shallow” groove? I am really interested in an answer for this, as many pressing from the ’70s on to the ’80s (in the U.S. at least) have this circle on the label (like the one on your first image on the right) which is located at the same place as the deep groove. Is there a name for that circle= Later on all the plants switched to the smaller circle, which you can find on all pressings nowadays. Interestingly, Germany for instance (and most of continental Europe) has always used the smaller circle, even early on in the ’50s and ’60s. Non-‘deep groove’ LP product where there is a circular indent, that is referred to as a ‘pressing ring’.